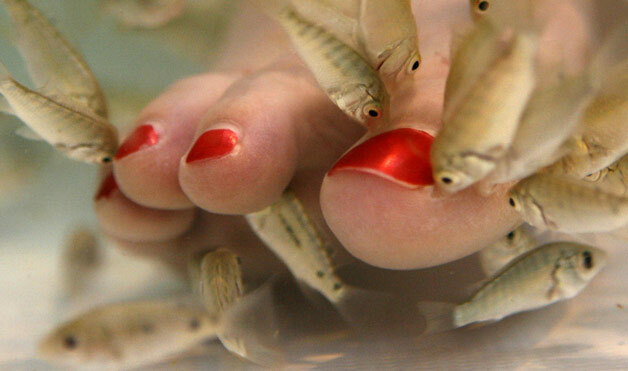 There are so many spas and salons around the world that are catching on the fish pedicure craze. What it is is that customers place their bare feet in a pool of tiny fish known as garra rufa or "doctor fish" to nibble away at their dead, flaking skin cells. After a 15-30 minute fish pedicure, most customers are treated to a standard pedicure and other foot treatments. Because the doctor fish can survive the warm waters of a foot bath, it is an ideal choice for a fish pedicure treatment. In a communal arrangement, often seen in Turkish or Asian spas, a number of clients can soak their feet in a shallow tank while large schools of doctor fish nibble on dead skin cells. The experience is said to be more ticklish than painful, since the fish are small and toothless. Have you tried this? Let us know!